I understand that you are not a fan of what is referred to as Obamacare. I don't know the specific reasons for your dislike, but I would assume it has something to do with it infringing on the healthcare business, where you spent a large part of your career. But whatever the case, you and I both know it helps people in Florida. I realize you resisted expanding Medicaid in the state, but you fought to keep the equivalent of the Low Income Pool. I don't claim to understand your rationale, because it's still federal money, but nevertheless, you saw the need to help the people in this state. You worked with Mr. Rubio and others to ensure that there was money available for people who needed it, and so public hospitals could stay open and provide services. When the last round of "repeal and replace" came about, I read with some interest that you again reached out to Mr Rubio to get an amendment waiver so that Florida could retain some federal money, and continue to help low income people. And now the latest bill sits in the senate. The sponsors and leadership there have made clear that it's "all or nothing," and no amendments will be considered. As it stands, the block grants that have been laid out would reduce the contributions to Florida by a number in the billions. I've seen various estimates ranging from $3 billion in year one to over $30 billion in 5 years. Whatever it actually turns out to be, the number is enormous and there is no way Florida could cover the shortfall, unless you raised taxes. I don't see how you can turn a blind eye to those less fortunate, after you worked hard to get LIP (or a similar program) money. And after hearing your compassion for Floridians during Irma, it would seem almost cruel to turn around and recommend that Mr. Rubio accept this legislation; people will suffer without access to affordable healthcare or public hospitals. I would hope you will confer with Mr Rubio and tell him this bill is not good for Florida, and that he should vote no. Look, I understand that the ACA is imperfect, and needs some work. But I don't believe this is the answer, and it will adversely affect millions in our state. I would hope we - all of us, regardless of party or office, or even ordinary citizens - can work on something better. I have heard you are still undecided on your vote for the latest round of "repeal and replace" for obamacare. Though I think we can be honest and just call it repeal because there isn't much in the way of replacement. I imagine that one step in your decision making will be to consult with governor Scott and other politicians, which I think is useful. But allow me to throw a couple of thoughts out there as a resident of Florida. Mr. Scott resisted expanding Medicaid in the state, but he fought to keep the equivalent of the Low Income Pool. You helped him to keep a similar program, ensuring that there was money available for people who needed it, and so public hospitals could stay open and provide services. When the last round of "repeal and replace" came about, I read with some interest that you and mr. Scott agreed that the money should still be available to Florida, and that you worked on an amendment waiver so that Florida could retain some federal money, and continue to help low income people. On this latest bill, mr. McConnell has made clear that it's "all or nothing," and no amendments will be considered. As it stands, the block grants that have been laid out would reduce the contributions to Florida by a number in the billions. I've seen various estimates ranging from $3 billion in year one to over $30 billion in 5 years. Whatever it actually turns out to be, the number is enormous and there is no way Florida could cover the shortfall, unless the state raised taxes. I don't see how you can turn a blind eye to those less fortunate, after you worked hard to get LIP (or a similar program) money. But there's another thing: I got your messages after Irma; you were working hard for the people in our state, to make sure they had the resources they needed and access to essentials. To turn around a few weeks later and simply undercut people's access to healthcare would seem almost cruel ; people will suffer without access to affordable healthcare or public hospitals. Of course, I should also mention that many groups, from doctors, to veterans, to seniors, to advocacy groups have all said this plan is bad, and are opposed to it. And finally, I wanted to call attention to the "Kimmel test" and mr Kimmels assertion that this legislation fails that test. Senator Cassidy thinks that it does not fail because he interprets it differently than mr Kimmel. And this a key point: he wrote it with something specific in mind, and interprets it one way. Others interpret the wording another way. If it's that unclear, then surely it's possible that there will be more questions, and it will lead to uncertainty and have unintended consequences. That's not good legislation, especially if it affects nearly every American - even those with employer-sponsored plans may be among said consequences - and 1/6th of the economy. It should not go forward like this. Take time to work through the details and come up with something better, and which actually is clear & concise, and keeps Florida in the red with the low income folks. 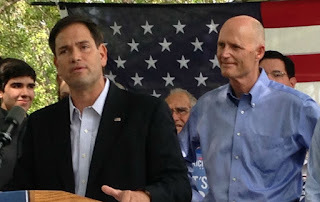 I would hope you see this bill is not good for Florida, and that you will vote no.